Thomas Lyte are honoured to be the Designers & Makers of The ICC Bat & Ball 2017 Awards. Played every four years, The International Cricket Council Champions Trophy took place in England and Wales in 2017. With rivals India and Pakistan battling head to head in the final of the tournament, it was Pakisatn, the lowest ranking club in the tournament that would be victorious. Handcrafted from the finest materials at the hands of our master artisans, the Golden Bat and Golden Ball were presented after the winner of the tournament was announced. Skillfully shaped like a cricket bat, the Golden Bat went to the Highest Scorer of the Tournament, Shikhar Dhawan from the Indian Cricket team who scored 338 runs. Set on top of a wooden plinth, the Golden Ball, handcrafted to represent a cricket ball, was presented to the highest wicket Taker in the Tournament. This was presented to Hasan Ali of Pakisatan for taking 13 wickets in five matches. A fantastic event, we are proud to be the Designers and Makers of The Farmfoods European Senior Masters Trophy. An inaugural tournament, it offers amateurs the opportunity to play, partner and watch some of the finest senior European Golf Players. With a clean design, this trophy features an elongated body with elegant tapered handles. Handcrafted using traditional techniques in our London workshop, this 70cm trophy sits atop of a wooden plinth. Finished with a golf ball resting on the lid, this trophy commands the attention it deserves. Continuing our close friendship with Tatler Magazine as the Designers and Makers of the Tatler School Awards, Thomas Lyte was featured on the IT list within their Tatler School Guide 2018. A must have christening gift, our Sterling Silver Egg Cup would make the perfect gift for any little prince or princess. As Proud Designers and Makers of The LMA Sir Alex Ferguson, Thomas Lyte was featured in the LMA Manager Magazine Autumn 2017 issue. With a double page spread, Thomas Lyte retold the momentous day that Sir Alex Ferguson visited our London workshop to cast his eye onto the trophy that would bear his name. With the continued partnership between the League Managers Assoistation and Thomas Lyte, we look to the future as Masters of Sport working together. Thomas Lyte are thrilled to be the Designers & Makers of the Nigerian Federation Cup. First established in 1945 by the Nigerian Football Federation, it has been played under different names over the years but is still remains a favourite among the hearts of Nigerian football fans. Handcrafted in our London workshop, it was funded by the 2012 President of the Lagos State Football Association in Nigerian. Exqusitely mastered from Sterling Silver, this trophy features squared handles and an engraved body. A dominating size, this trophy reflects the strength of the eagle featured on the NFF logo. Continuing on our collaborations with FIBA and Radiant Studios, Thomas Lyte are proud to be the Makers of The FIBA Afrobasket Cup. Orginally known as The African Championship of Nations, this basketball competition was first established in 1962. Grown to 16 of the best competing nations, the qualifying teams will face off against teams from across the world for the FIBA World Cup in 2019. Taking in the excess of 130 hours to craft, the Afrobasket trophy stands at 60cm high and 26cm wide. The trophy features a spirraled inside symbolising the movement of a basketball. Sterling Silver and gold plated, this trophy has an elevated basketball and gold plated Africa which has been handcrafted in our London workshop. It also features the connecting band that all the new FIBA trophies have, and stands as the only matching feature between them. For this exquisitely modern trophy, our silversmiths used the traditional silversmithing processes of spinning, chasing, guilding, plating, engraving and polishing to bring all the elements together. Thomas Lyte are proud to be chosen and entrusted as The Restorers of The Women’s Rugby World Cup. As the premier international competition for women in rugby, this tournament was first established in 1991 and is held every four years. It features 12 teams from across the globe with the top seven teams from the previous tournament qualifying automatically. 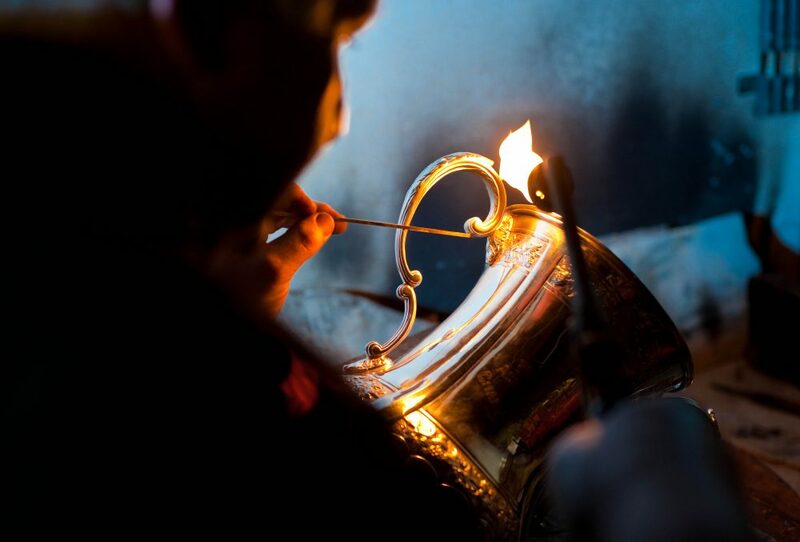 Each year in our London workshop, our skilled silversmiths repair damages, polish the silver and ensure that it is restored to its former glory for generations to enjoy for years to come. 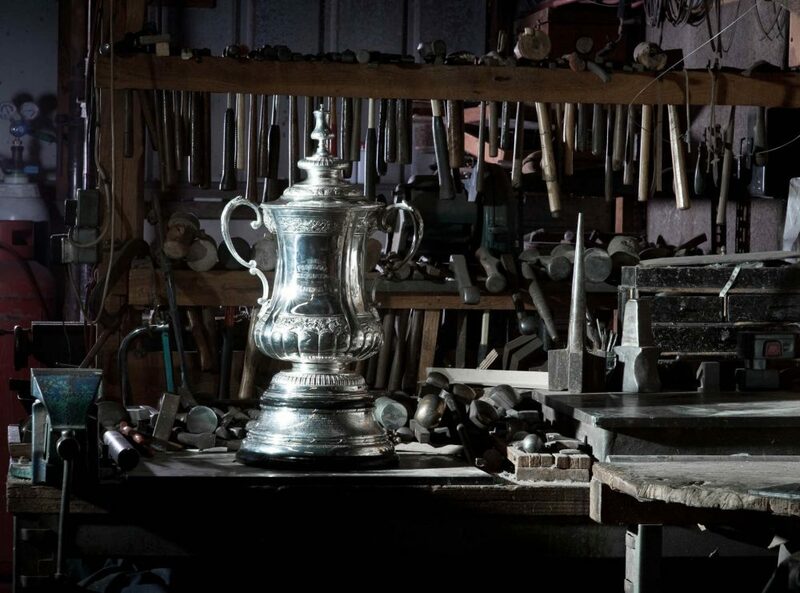 Every week, we like to celebrate the iconic sporting silverware that we have helped craft in our London workshop. This week, we are showcasing the FIBA’s gleaming AmeriCup Trophy, the Women’s Rugby World Cup and The Laver Cup. Volleying into action first is FIBA’s gleaming AmeriCup Trophy! In a new era for basketball, the brand new competition launches tomorrow, with competing nations vying to be crowned the King of the Americas and lift the 60cm tall trophy for the first time. Our artisans spent more than 70 craft hours hand making the trophy in our London workshop from Sterling Silver. The trophy, designed by our partners Radiant Studios, features a unique 24ct gold plated band. It visually connects all of the new trophies crafted for FIBA this year, as the only matching design element between them. The ingenious design and craftsmanship creates the effect of levitating a basketball. The Americup is one of a suite of trophies commissioned by FIBA that Thomas Lyte has crafted, which include the FIBA Asia Cup Trophy, the FIBA World Cup Trophy and the Basketball Champions League Trophy. Thomas Lyte wishes the 12 competing nations all the best. Here’s to an enthralling inaugural AmeriCup! It has been a tense few weeks for the Women’s Rugby World Cup but this week sees the conclusion of this prestigious tournament with England versus New Zealand on Saturday the 26th of August. The trophy first departed the World Rugby Hall of Fame in Rugby on the 13th of March to make it’s way around the island of Ireland in the lead of to the tournament. For the fourth time in Women’s Rugby World Cup history, England and New Zealand will go head to head. New Zealand have been successfull in the previous three matches but can the English push it across the line? We wish both teams good luck for this weekend! Yesterday, seen the announcement of The Laver Cup. A new tennis tournament, the Laver Cup is an international men’s tennis competition with two teams of 6. One team representing Europe captained by Bjorn Borg, and a Rest of The World Team captained by John McEnroe. The trophy and tournament have been named in honour of Australian legend Rod Laver. Unsuprisingly Borg has selected Roger Federer, Rafael Nadal, Marin Cilic, Austrian Dominic Thiem, Czech Tomas Berdych and Alexander Zverev. Interesting however, for the Rest of the World team, John McEnroe has selected Juan Martin del Potro, Denis Shapovalov, Milos Raonic, John Isner, Jack Sock and Sam Querrey. Slamming into action from September 22-24 in Prague, it will be exciting to see how Federer and Nadal fair as team-mates rather than opponents! Thomas Lyte are honoured to be the Designers & Makers of The UEFA Europa League Player of the Season Award. This award is selected by a jury composed of the coaches of the 48 clubs in the UEFA Europa League group stage, together with 55 journalists selected by the European Sports Media (ESM) Group. Handcrafted by our silversmiths in our London workship, it was made from solid silver and 24 carat gold plating and stands 36cm tall. Inspired by the stunning Europa League trophy, the Player of the Season Award is crafted from a single sheet of silver and hand planished using a historic metalworking technique to give a wonderful textured finish. The award is created from 11 individual spears of sterling silver. 10 spears create a majestic crown with a commanding central and elevated spear towering above the crown. A total of 60 craft hours have been taken to create this trophy, which goes through a process of exquisite silversmithing, polishing and plating. The first cup in our #TrophyThursday series is a real classic, The Emirates FA Cup – on what is the competitions’ 146th birthday! Thomas Lyte was commissioned in 2013 to recreate the treasured FA Cup, having carefully restored the previous edition for 18 years. Over time, the features of the original trophy had worn away and the FA requested a new model based on the original design to retain the competition’s history. Officially known as The Football Association Challenge Cup, it is a masterpiece of English silversmithing. Handcrafted by our team in London, it took over 250 hours hand-crafting the trophy from 6.3kg of Sterling 925 Silver. The 61.5cm tall trophy underwent the exacting processes of casting, hand chasing, hand engraving and polishing. These processes ensured that the third edition of the cup was a perfect replica of the original trophy. Arsenal captain Thomas Vermaelen became the first player to lift the latest edition of the Emirates FA Cup after the Gunners’ 3-2 victory over Hull City in the enthralling 2014 final at Wembley. The competition was originally agreed on this day, the 20th of July in 1871 when Charles Alcock, the FA’s Secretary, had a proposal approved to introduce a ‘sudden death competition’ he had played at Harrow School but on a bigger scale.The original trophy was designed and made in silver by Martin Hall and Company for £20 and was known as ‘the little tin idol’. The FA Cup is a national treasure and one of the most recognisable and cherished trophies in the world. Through the expertise of the Thomas Lyte craftsmen, the cup is restored to its former glory ready ahead of The FA Cup final at Wembley. 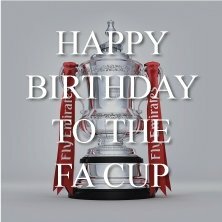 Happy Birthday to the FA Cup! We look forward to enjoying many more magical moments together.